Purchase your membership card for 20% off match day ticket prices, special match day promotions, cashback on merchandise purchases, 10% cashback at Mill Farm venues and more. Cards can be used to pay at; Bradleys Sports Bar, Milano’s, Aroma Cafe, Churchill’s Bar and AFC Fylde. 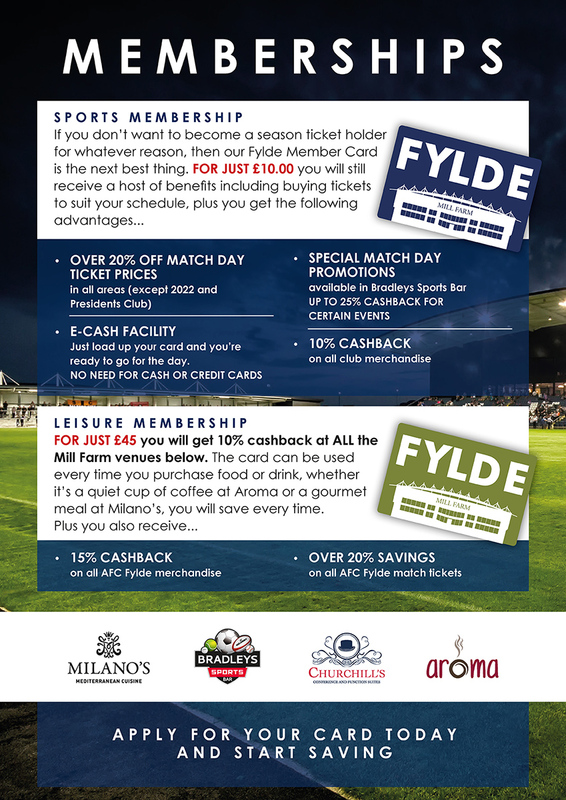 Visit the AFC Fylde ticketing website to purchase your membership. With eight five a side, two seven a side and a full size 3G pitch, you won’t find a better place to enjoy a game after work with your colleagues or friends. New leagues coming soon. Milano’s Mediterranean restaurant will raise the bar as we bring together two of the area’s best known chefs and restaurateurs, Bevan Middleton and Grant Beech. With an outdoor terrace for Al Fresco dining, it’s set to become a Fylde favourite. The place to meet friends and enjoy our huge array of gourmet sandwiches and cakes together with the best cup of coffee on the Fylde - seating both inside or out. Set to become the number one destination for celebrations, weddings, meetings or joining the AFC family on match days. Churchill’s will set new standards for entertainment on the Fylde Coast.